Same as every other post, this starts with a declaration of love, and today it’s about my favourite dessert flavour combo – Mint Chocolate. I believe everyone has his/her own weakness in food choice; and no matter how hard I try to resist it, mint chocolate is beyond doubt mine. This is especially true when it comes to ice-cream flavour. Why? It is equal parts cool and sweet, and the best ones are so refreshing that they’d brighten up my day and clear my mind. Despite how mouthwatering and delicate they look, cupcakes are not something I’d usually order outside. Yet, as it’s one of my goals to try out as many kinds of desserts as possible on this blog of mine, I might as well give it a go, right? In a mixing bowl, sift and combine flour, cocoa powder, baking powder, salt. Set aside. Add eggs, one at a time, and continue beating for 1 min. Add coffee, milk and melted mint chocolate, and continue beating for 30 secs. In 3 batches, pour the prepared dry ingredients into the mixture, and gently stir with a spatula until just incorporated. Do NOT overmix. Using an electric mixer, beat the butter at medium-high speed until smooth. Finally, add milk, vanilla, mint extract, food coloring, and salt, and beat until light and fluffy. Refrigerate the frosting for at least 30 mins before piping. 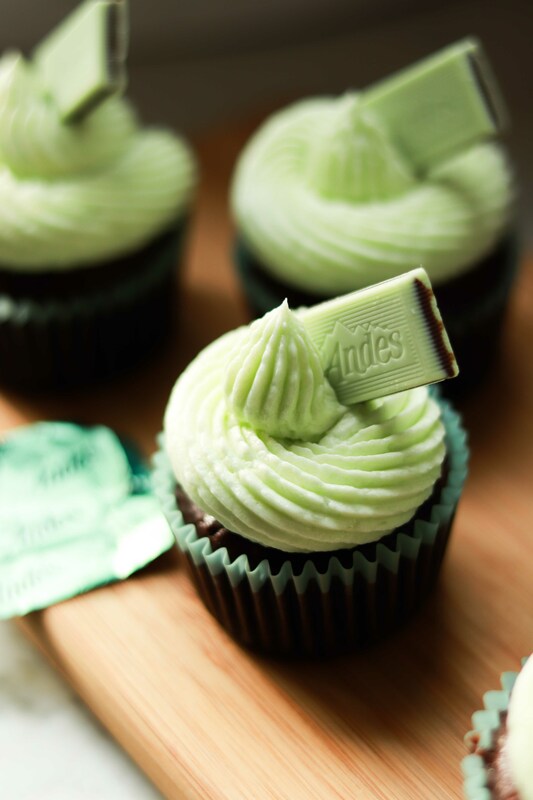 Pipe the buttercream onto the cupcakes with your favourite piping tip, and put an Andes chocolate mint on top as decoration if desired. A perfect combination. I like the name of this mint chocolate cupcake “minty breeze”. Really refreshing and let you feel like flying in the cool sky when you taste the cake. Great Idea. Thank you so much for sharing this amazing recipe. Will try this for sure.